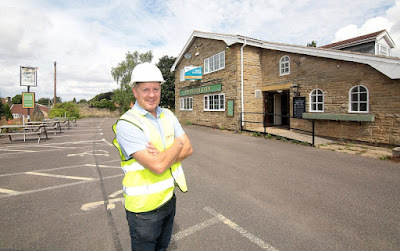 Work is well underway on a £470,000 refurbishment of The Parish Oven in Thorpe Salvin by Heineken-owned Star Pubs & Bars and new licensee Gary Hunt. The picturesque village's only pub has been closed for six months and the investment is expected to transform the tired local. Work is expected to take eight weeks, with The Parish Oven scheduled to reopen in mid September, creating 35 new jobs. The news follows on from Hunt and Star Pubs re-opening the The Masons Arms in Thorpe Hesley, following a £430,000 revamp. Gary Hunt, chief executive of Fine and Country Inns (pictured), said: "Thorpe Salvin is a such beautiful village, it has been a real shame to have a closed pub at its centre. I've had my eye on the Parish Oven for some time and am delighted to be taking it over. I want to make it an asset to the community and a pub they can feel proud of again." Exterior work will focus on making the Seventies pub an attractive feature of the village and will include cladding and re-decorating, enlarging windows and adding new signage, lighting and planting. The currently overgrown garden will be re-landscaped and an alfresco eating and drinking area – with seating for 100 as well as heating and lights – put in. The pub's interior is receiving a complete refurbishment in a classic but modern style. Research has been carried out on Thorpe Salvin's history back to the 1700s and plans are to have pictures from the past on display. The designs include a dedicated bar – for those just wanting a drink – as well as two dining areas and an enlarged open-plan kitchen to enable the pub to serve an extensive, freshly prepared menu of popular pub classics and gourmet dishes. Barista-quality coffee and tea will be available all day. Gary is also investing in the cellar, installing state-of-the-art dispense equipment. Cask ales will have a prominent place on the bar alongside wines and cocktails. Grant Morgan-Tolworthy, operations director for South Yorkshire at Star Pubs & Bars, said: "Heineken is committed to investing in pubs in order that they can thrive at the heart of their communities for the long term. We acquired The Parish Oven in March and have been working with the local council to reopen it as quickly as possible. Gary knows the area well and is a superb licensee; we feel very fortunate that he is taking over The Parish Oven."